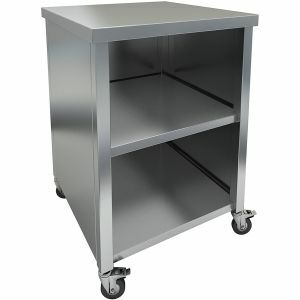 The stainless steel base, closed from 3 sides, has a solid table top and a shelf. 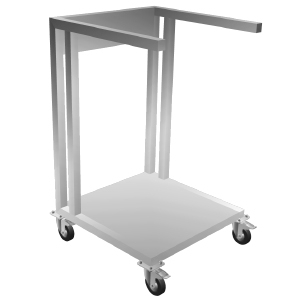 Complementary four wheel mobile cart for Vortex Popcorn™ machines Robopop®and MiniRobo S1. This cart is intended for holding a poly bag filled with popped corn. Helps to facilitate and speed up the process of substitution of an empty bag for the filled one. 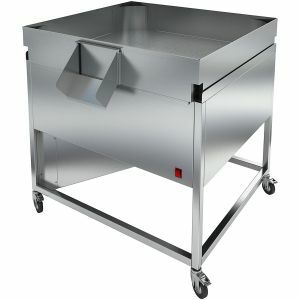 The Stainless steel dispenser is designed for oil supply. 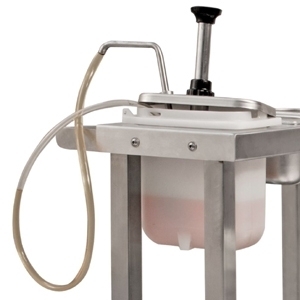 The dispenser is installed on Batch Coater table top and equipped with 3.3L plastic container. Cooling module for popcorn, COOL system, 1.13m. 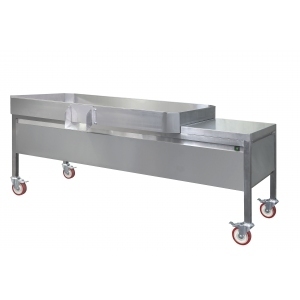 Motorized mixer-coater, mounted on a mobile base, for flavoring and coating popcorn, such as buttered oil, salt, sugar powder, cheese powder, cheese paste and other savory additives. The coater, secured on the mixer, rotates vertically, providing even, uniform coating of the product. 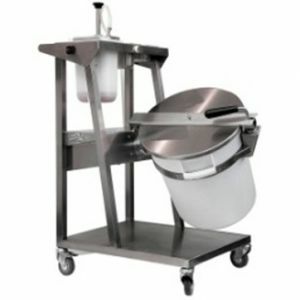 This Mixer is mounted on a mobile base and has a table top with two insert bowls GN1/9 and one oil dispenser. Popcorn Cart for a popcorn display warmer is red painted, with a top sign. The cart has a cooled inside volume for soda bottles. The cart bottom is inclined to make bottles to roll down to the front edge. The cabinet is closed by a Plexiglas door. There are two bottle shelves on the right and three cup dispensers on the top. The cart capacity - 21 bottles in one layer (effective cooling), max. up to 60 bottles. The table top dimensions - 1200х550mm. 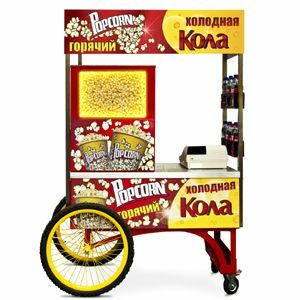 Together with the VTP-060A popcorn display warmer (sold separately) the cart becomes a mobile sales outlet. The car is intended for indoor use.